The National Food Consumption Survey has shown that most South Africans do not consume enough vitamin A, thiamin, niacin, riboflavin, vitamins B6, B12 and C, calcium, iron and zinc. Lack in dietary variety and low intakes of fruit and vegetables, legumes and animal­ source foods are singled out as reasons. At the same time South Africa has high rates of the so ­called chronic diseases of lifestyle – non­-communicable diseases related to dietary factors. These include heart disease, high blood pressure and type 2 diabetes, which are all associated with overweight and obesity. Thus, both under­ and over­nutrition are rife in our country. It means ‘double trouble’ for nutritional growth and prosperity. In­ depth investigations internationally and in South Africa have shown that the unique composition of dairy products helps to address both current nutrient deficiencies and the risks for developing chronic diseases. Yet dairy intakes of South Africans are well below the recommended daily intake of about 500 ml (2 measuring cups) of milk. 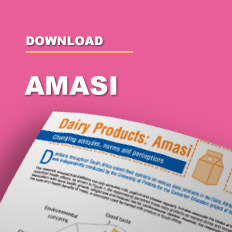 Hence the Department of Health formulated a new dietary guideline to promote intakes of specifically low­-fat milk, maas and yoghurt. Milk is a source of high­-quality protein, supplying the amino acids that the body needs to build muscles and other tissues. Dairy furthermore should significantly contribute to South African children’s intake of vitamin A, riboflavin, zinc and vitamin B12. Without sufficient dairy intake, it is highly unlikely that consumers will meet their calcium requirements. Calcium is well known for its role in bone health, which emphasises the importance of dairy for optimal growth in children and adolescents. However, owing to the lack of protein and energy many South African children, are stunted, meaning they are short for their age. In this group of children adequate milk intake, providing high quality protein as well as calcium reduces the problem. In recent years it has become clear that calcium in general, but particularly the calcium from dairy, is also important in the prevention of non­-communicable diseases. About 50% of the beneficial effect of the well-known DASH diet, which is recommended for lowering blood pressure, is attributed to the dairy component of the diet. The calcium in dairy offers credible explanations for the observed effect and hence a food-­based approach rather than supplementation (tablets), is recommended. Calcium also appears to play a role in regulating body weight, body fatness and the development of metabolic syndrome. Clearly dietary calcium is important for the South African population, among whom high blood and obesity are sky-­rocketing. The fat in dairy has many faces. Milk fat consists of more than 400 different fatty acids, each with different effects. Since a healthy diet is one where the energy (i.e. kilojoules) from fat does not exceed 30% of the total energy intake, the emphasis should remain on consumption of low­-fat dairy. However, increasing scientific evidence suggests that the quality (type) and food source of the fat may be as important as, or even more important than, the total amount of fat. The type of fat in milk, and in particular the matrix in which the fat occurs, appear to be critical. For example, whilst industrially produced trans-fats are detrimental for health, this may not hold true for vaccenic acid, which occurs naturally in dairy. Similarly, conjugated linoleic acids have remarkable biological properties. In addition, studies have shown that milk may actually play down the effect of saturated fats on blood fat levels. 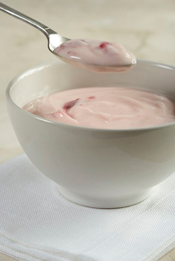 Milk in fermented form (as in maas or yoghurt) may have additional health effects. This may be related to the lower pH (acidity), which affects the rate at which the stomach is emptied and thereby reducing the glycaemic response (i.e. the effect on blood sugar). Alternatively the beneficial effects may be due to bio-active peptides present in fermented dairy. These substances have been linked to improvement of cardiovascular symptoms (e.g. high blood pressure) and of low­-grade inflammation (evident in obesity). 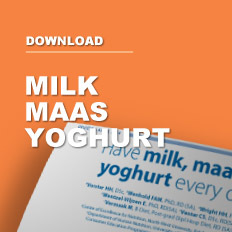 • Encourage optimal use of milk, maas and yoghurt among consumers. 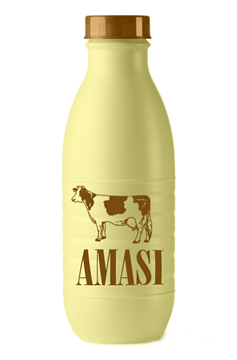 • Consistently offering milk as a beverage to children will ensure that drinking milk becomes a lifelong habit. • The addition of milk, maas or yoghurt to cereals and porridge, as well as milk to coffee and tea can also make a difference. • Do not forget milk in cooking, and yoghurt in the lunch box! 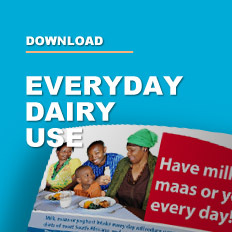 Having milk, maas or yoghurt every day packs a punch in the fight against both existing and future nutritional problems. It’s a double deal. 1. Labadarios D et al. 2000. The National Food Consumption Survey: Children aged 1–9 years. 2. South Africa. Pretoria: Department of Health. Steyn NP et al. SAJCN 2006. 19(2):66–76. 3. Bradshaw D et al. 2006. Burden of Disease study. SAMJ. 4. Gao X et al. 2006. J Am Diet Assoc. 106:1759–1765. 5. Hoppe C et al. 2006. Ann Rev Nutr. 26:131–173. 6. Lamarche B et al. 2008. J Am Coll Nutr. 27:741S–746S. 7. Crichton GE et al. 2011. Obesity Rev. 12:e190–e201. 8. Lawrence AS. Milk and milk products. In: Mann J & Truswell S (eds). Essentials of human nutrition. 4th ed Oxford: Oxford University Press, 2012:420–423. 9. Tardy AL et al. 2011. Nutr Res Rev. 24(1):111–117. 10. Troegeler­Meynadier A et al. 2005. Rev Med Veterin. 156(6):323–331. 11. Lorenzen &, Astrup A. 2011. Br J Nutr. 105:1823–1831. 13. Choi J et al. 2012. Int J Dairy Tech. 65:1–12.